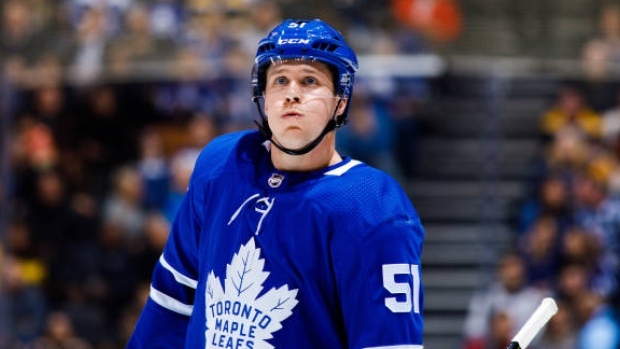 TORONTO – In the three days since Jake Gardiner became a first-time father to son Henry, the Maple Leafs’ defenceman has embraced the unorganized chaos of parenthood. Gardiner was immediately given a short furlough from the Leafs to spend time with the family’s new addition, which delayed his first appearance in exhibition play until Saturday against Buffalo. That decision was perfectly fine with Gardiner. He and wife Lucy have their mothers in town to help care for Henry, but that hasn’t excused the blueliner from experiencing a certain bleary-eyed rite of passage. Joking he and Lucy have “no idea what we’re doing right now” after bringing Henry home, the Minnesota native has been asking around Toronto’s dressing room for tidbits of advice from fellow fathers. Head coach Mike Babcock is a dad of three and remembers well the overwhelming early days after his eldest was born. That may be, but Babcock has long been a proponent of players cultivating as rich a life as possible off the ice, giving them an escape from the sport’s inevitable roller coaster of emotions. Such a dose of familial perspective couldn’t have come at a better time for Gardiner considering how last spring’s playoffs ended. The Leafs had clawed their way back from an early 2-0 series deficit against Boston in the first round of the Eastern Conference playoffs and forced a Game 7 on the road. Gardiner had played decently to that point, but his minus-5 performance in the decisive contest was historically bad, tying an NHL record for worst plus/minus ever in a Game 7. Afterwards, Gardiner shouldered much of the blame for Toronto's season ending in the 7-4 loss, despite teammates repeatedly rallying to his defence. "It took a while [to get over],” Gardiner said last week. “It was a tough. The next couple weeks were tough, but I got through it. You just kind of need to move past it. I don’t really want to talk about it too much anymore and I’m just looking forward to this year." When he was able, Gardiner began focusing more on what went right against Boston than all that went wrong in Game 7. He led the Leafs’ in ice time at 22:39 per game and was minus-1 after the first six contests, while adding two assists. “I had one bad game and it's kind of all you really think about at first,” he said. “If there's one thing I can take away from it, it's just play the way I did the other six games and just flush it out and get ready for [now]." That this is also a contract year for Gardiner makes it all that much more important he leave the past behind. Gardiner is in the final season of his five-year, $20.25 million deal, and while there have been some discussions between his agent and Leafs’ management, no extension is imminent. With a young family now to consider in negotiating the next contract, Gardiner was clear there’s no place he’d rather be than Toronto. At the moment, Gardiner will have to settle for just getting back on the ice. Having not played a real game since that heartbreaking night in Boston, he’ll have plenty of rust to shake off against the Sabres, not to mention a little potential drowsiness.